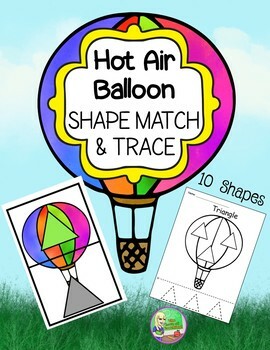 Use this hot air balloon themed math center as a shape sorting activity for preschool, pre-k, kindergarten, homeschool or any autism or special education classroom. It can also be used for a speech therapy activity or for early finishers. 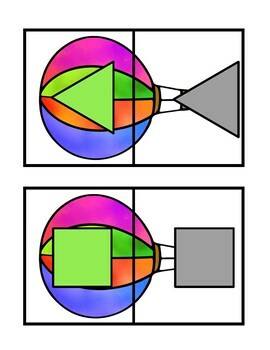 This fun matching game helps you teach students to identify the basic geometric shapes. 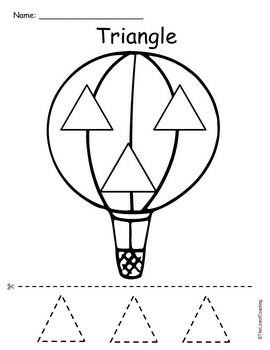 Students will match 2-D shapes, by matching the colored shape on the top of the hot air balloon to the silhouette of the shape on the bottom of the balloon. Perfect for your spring theme, transportation theme, or hot air balloon units. Use in early math centers, math tubs, or math work stations. This math station can be used as an individual or small group activity. You can make the shape matching cards self-checking by placing matching stickers on the top and bottom of the card before you laminate. Set also includes 10 no prep worksheets. 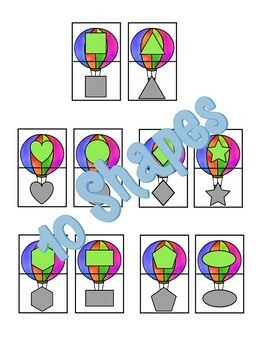 The shape worksheets are designed for students to trace, cut and paste a variety of shapes These are great for early finishers, as bell ringers, for homework or for extra practice for special education students.